Lieutenant Clarence S Jeffries, believed to be dated 1915. Captain Jeffries was serving with the 34th Battalion Australian Infantry during the Battle of Broodseinde Ridge which began on 4th October 1917. The attack successfully achieved its objective on the first day of the battle and reached the high ground just below the summit of the Broodseinde Ridge. A few days later on 12th October the attack continued. The Australian battalions moved over the summit of the ridge and attempted to push the German defence down the reverse slope in a north-easterly direction towards Passchendaele village. Captain Jeffries was Officer Commanding “B” Company of 34th Battalion. He was in a position between the location of Tyne Cot cemetery as it is now and the German cemetery near the railway at DASH CROSSING. There were numerous German blockhouses and pillboxes to be knocked out which were holding up the Australian attack. The advance of the 34th and 35th Battalions was held up by enemy fire from their left at AUGUSTUS WOOD, from their centre at HILLSIDE HOUSE and on the right from a house near DEFY CROSSING. The delay caused to the attack by the German defence from these strongpoints was threatening to hold up the whole attack. Two captains from the 35th Battalion, Captain Carr and Captain Dixon, made an attack on the pillbox in the centre of the position and a German trench to its rear, knocking four machine guns and 35 Germans out of the fight. Captain Jeffries also organised a party of men to attack a pillbox which was firing at the attack from near to the Zonnebeke-Passchendaele road, north-east of HILLSIDE FARM and at the highest point of the ridge. 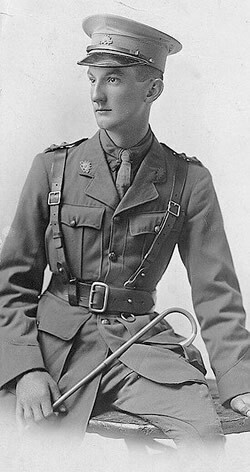 The Adjutant of the 34th Battalion, Lieutenant A Gibson Farley, gave details of the action in which Captain Jeffries took part. (1) Being held up by a German machine gun post, Captain Jeffries led a party of 2 N.C.O.s, including Sergeant Bruce, and 12 men. They captured a machine gun post, which included 4 machine guns and 35 Germans. Another enemy strong point later caused problems for the advancing unit and so, under heavy machine gun fire, Captain Jeffries led another party of men against the enemy strongpoint. He and his party of men captured more enemy machine guns and another 30 German soldiers. Captain Jeffries was mortally wounded by a machine gun bullet in the stomach. For his actions Captain Jeffries was posthumously awarded the Victoria Cross. According to the account by Lieutenant Gibson Farley no field burial took place at the time of his death. This is presumed to have been because the Australians dug in and consolidated a Front Line just to the rear of the location where he fell. However, a burial did take place at some later date, possibly when the Battalion moved forward towards Passchendaele village, passing over the ground where Captain Jeffries' body lay. In correspondence with Jeffries' father after the war, a letter from the Commonwealth of Australia Office confirms that Captain Jeffries' body was exhumed from map reference 28.D.11.c.5.5. in 1920 and re-interred in Tyne Cot cemetery. This map reference is for map 28, square D. Subsection square 11 can be seen on the trench map illustration. The reference at C refers to the “c” square within square 11. The “5.5.” refers to the horizontal and vertical grid location, which places the exhumation of the body of Captain Jeffries exactly in the location of the “c” on the north east corner of Augustus Wood. 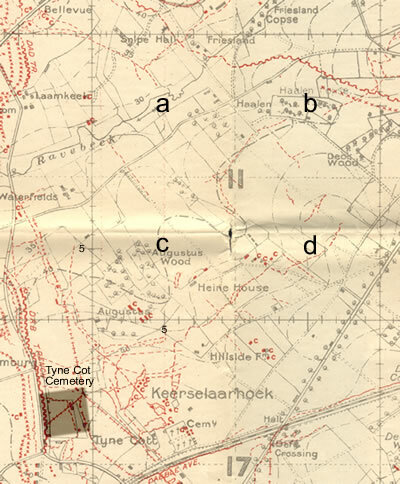 The Commonwealth of Australia Office letter confirms the the body was found at a location 150 yards from north west of Heine House and 750 yards north west of the point where the Ypres-Roulers railway crosses the Zonnebeke-Passchendaele road at DEFY CROSSING (at the word HALT on the trench map). With each numbered map square being 500 yards square, these distances agree with the trench map. Grave Location for Captain Jeffries, V.C. Captain C S Jeffries is buried in Tyne Cot cemetery, grave reference Plot XL, Row E, Grave 1. Captain C S Jeffries, V.C: Service Record, available to view online at the National Archives of Australia World War 1 Service Records. (1) Captain C S Jeffries, V.C: Service Record, p. 57. (2) Captain C S Jeffries, V.C: Service Record, p. 41. (3) Captain C S Jeffries, V.C: Service Record, p. 33. Website: www.awm.gov.au Official History of Australia in the War of 1914-1918, Volume IV, The Australian Imperial Force in France, 1917 (11th Edition, 1941), by C E W Bean., Chapter XXII, p. 913. PPhotograph of C S Jeffries: source Findagrave.com and acknowledged courtesy of Abermain Heritage Preservation Society.